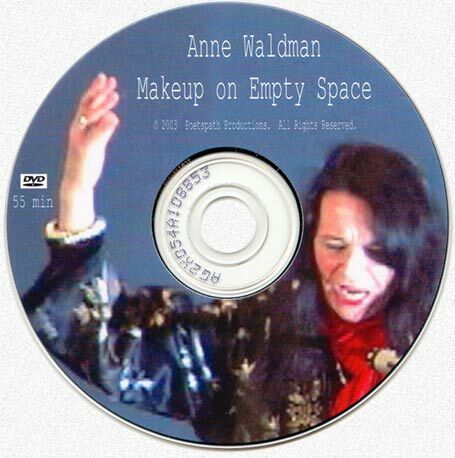 Anne Waldman: Makeup on Empty Space, profiles the life and times of poet Anne Waldman. Shot during an Anne Waldman Symposium held at the University of Michigan in Ann Arbor, March 13-15, 2002, this 55 minute videograph documents the opening of the AW archive at the UM Special Collections Library, and features poetry luminati speaking on Waldman's megacontribution to American letters. There are also shots of the exhibit that the UM Special Collection curators assembled that are soundtracked with recordings by Anne Waldman. The film is fast passed, and perhaps the only one of its kind profiling Anne Waldman's life and work. It was premiered at the Boulder Museum of Contemporary Art in June of 2003.